A former regional daily journalist says he contemplated suicide after a council pursued a “mystifying and terrifying” defamation claim against him. Ex-Hull Daily Mail staffer Steve Anderson has pledged to take legal action himself and accused East Riding of Yorkshire Council of “absolute stupidity” after discovering the authority spent more than £3,500 on contracting a solicitor over a novel he wrote. The novel, called ‘Karma’, featured fictional characters whose names resembled those of “current and former” members of staff at the village primary school where his wife Helen worked. Steve, pictured, planned to bring out ‘Karma’ in mid-December 2017, but says he received a letter from a solicitor acting on behalf of the council on 29 November last year which accused him of having “defamation at the front of your mind”. In his defence, Steve submitted lengthy excerpts from the book demonstrating that, where “real” names were used, the fictitious characters worked in caring professions 200 miles away from the school and with no inference of wrongdoing. After Steve denied his guilt to the solicitor, the school and the council, as well as pledging £250,000 to anyone who could prove they had defamed him, the council relented. Steve, who worked for the Mail for 25 years as a district reporter and photojournalist, told the North Yorks Enquirer the matter had been “mystifying and terrifying,” leading to “bouts of deep depression such as I hadn’t experienced for almost 20 years”. He said: “Absolutely no-one has apologised for their vindictive action. And the council’s absolute stupidity is continuing. Helen can’t set foot anywhere near the school without suffering from palpitations and chest pains because certain of her colleagues, whom she’d assumed had been her friends, effectively stabbed her in the back by crying ‘libel’ when all they’d had to do was take up our offer to provide proof that ‘Karma’ defamed anyone in the slightest. “This council, aided by its hired ‘dispute-management’ specialists, has replaced fairness and decency with a combination of malice and complete disregard for common sense. “I’ve lost countless sales because I’ve not felt able to promote ‘Karma’. Thousands of hours have been wasted while I’ve been writing letters, researching the options or merely lying in bed contemplating taking my own life. 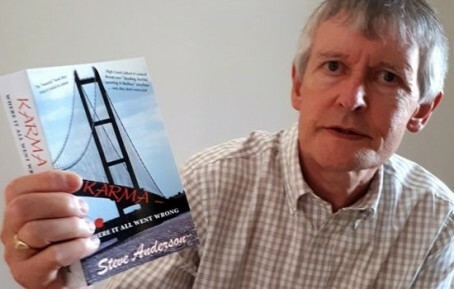 ‘Karma – Where it all went wrong’ is available as both a physical and e-book directly from York Publishing Services or from Amazon and other retailers. HTFP has approached the council for a comment. So, by the council’s curious logic, if you were born Patrick Phelan, you could sue the makers of Coronation Street! crazy stuff. you would think the council had something better to do.